What a minute…isn’t this Bible study on the book of Philippians – shouldn’t it be mostly about joy!? Oh no! I don’t want to study suffering…whenever I study something my life seems to mirror the topic. I really like the verses in 1 Peter. Being a past grammar teacher (please don’t judge my grammar now…many many brain cells have died since then), I had the fleeting thought of diagramming the verses to see what modified what and all that English major geeky stuff. 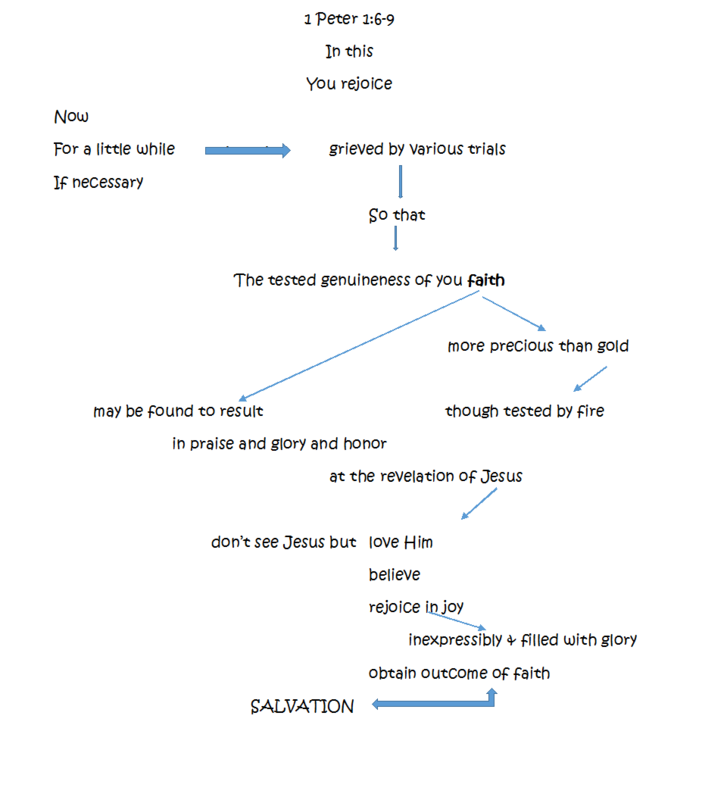 Instead I decided to diagram 1 Peter 1:6-9 my own way. It was interesting to see it all laid out visually. I’m a consummate visual learning. Big pictures are good for me. So often I need big pictures, hand-written notes, and some serious concentration to understand. Sometimes a friend will say that I’m a deep thinker…really I’m not. Occasionally I’ll have a profound thought but if I don’t write it down immediately it’s gone…forever. So as I’m studying today I thought I’d write down what God is showing me about suffering. I’m in an interesting place right now. There is no big thing causing me to suffer great amounts of pain or sorrow. I’m living a life that is just simply challenging. I don’t believe it’s more difficult than most nor is it easier than most. It’s just my life. Oh my goodness! I’m so ashamed of those thoughts. I’m not sure what was different at that point except that God was softening my heart with all the love and grace He was pouring into my life. I’d received so much of it that I was able to offer it…not out of the goodness of my heart but out of the overflow of His. The suffering in my life has produced something good. Something wonderful. I believe that I’m becoming a more compassionate, kinder, more grace-filled woman. It doesn’t always show but God’s working with me. Becoming more and more that godly woman has become the desire of my heart. I have a vision for it…for her…that woman, mother, friend, daughter, Christian I want to be. It sounds an awful lot like the character thing that Paul mentions in Romans 5:3-5! Maybe I was wrong about wanting more character…well, I think I should probably take the word maybe out of this sentence. I can always use more character. And hope. Who doesn’t want more hope!? I most certainly do. Each day I’m beginning to understand more and more the hope that is mine in Christ. How beautiful that God continues to bring us back to Him. What a blessing to know that in the midst of great suffering there is hope. Not only can we bring all the difficulties of our suffering to God, but we can trust Him to bring us through it all. Those Psalmists probably were groaning to the Lord and the Spirit was interceding for them…searching their hearts. He interceded for them just as He does for us. And the confidence of that intercession brought them to the same place those verses in Romans can bring us…a place of understanding that God will always work things together for good. Thank you Father! Jesus LIVES to make intercession for us! Lives to do it! What!?! Jesus lives to plead on my behalf. Doesn’t that just blow your mind? Not only did He live the sinless life I couldn’t, die the death I should’ve, and be raised to life again with power I can’t comprehend…He NOW lives for me! Jesus is so all about me! A lot of the verses I read this morning were about sharing in the sufferings of Christ, having a desire to know Christ better through His sufferings, following the example He set while suffering, and glorifying Him through our suffering. I think being all about Christ means that I’m willing to suffer for Him, with Him, like Him. I don’t think it means that I have a desire to suffer but rather a willingness to because it is a “gracious thing in the sight of God” (1 Peter 2:18-25) and it brings Him glory and me growth in my faith. I write about suffering with great trepidation. It’s not based on anything Biblical, just a fear of more suffering. I wish I was braver. I trust God and I know He uses it all for good, I just hate going through it. I understand though and, like the Psalmist, I do believe that God is worthy of praise and trust even in the trials. Studying suffering is going to be good for me. Reminding me again that God is good even when life is bad. That I can indeed rejoice in my suffering because I have Jesus. Time to put the proverbial big girl pants on and get busy in the Word!